What a name, and what a game. 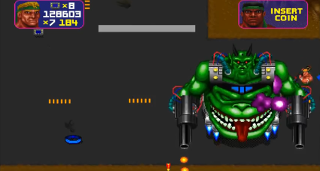 This classic arcade top­down shooter from 1992, developed by Midway Entertainment, is an action­packed slug­a­thon that makes a brilliant two­player game with its fast­paced gunfights, hordes of evil mutants and buckets of blood and gore. 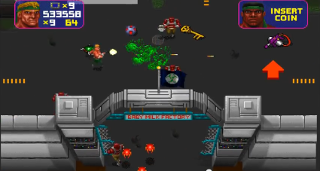 Players can bag the game on various formats, with the original, untouched versions being part of various Midway arcade retro game collections. In 1999, the evil General Akhboob was developing secret weapons in his totally innocent ‘Baby Milk Factory’, until a reporter discovered its true purpose and helped spread the word the General’s chemical weapons and army of mutants. Covering up the case by capturing all reporters and tourists in his country, the Doomsday squad, consisting of two muscle­bound weight­lifters called Captain Carnage and Major Mayhem, are sent in to stop his nefarious plans, rescue the civilians and fry Akhboob. hauling bad­asses you play as who merrily fire in the air when completing a level with the higher score (the loser will think pessimistic thoughts in the corner). Some of the deaths look both gruesome and comedic, especially when your innards are blown away as you fly into the air or after touching an electric fence. Even the gruesome deaths and cutscenes are lovely to watch. The sound effects for things like explosions and gunfire sound great. Even the dialogue from the characters (which aren’t some compilation of 8­bit fart noises or any crap like that) are top­notch quality for the time. Listening to General Akhboob rant threatening gibberish on the television is always funny to listen to as well. Accompanying the carnage is a decent soundtrack with a nice beat. Playing from a top­down perspective, the game­play is smashing. One control stick (or analogue stick on modern consoles) will control movement, and the other controls aiming, and with eight directions to move from and fire at, it’s very smooth and lacks a big learning curve. Starting off with a standard machine gun, you can swipe a rocket launcher, a grenade lobber, time bombs and two types of flame­thrower (the second one has a blue flame, which deals more damage and has a bigger range), all with limited ammo. Invincibility and projectile ­spreading power­ups are also available to help you bring the pain. Total Carnage is twice as fun when you play with an ally. It looks brilliant, it sounds brilliant, and it plays like a brilliant game should be. Going around fighting solo is only half the fun, and all these tough bosses, and the impossible demand for all the keys, make it one heck of a challenge to fight through. With blood, explosions, humour and mutants, it’s a personification of the perfect action film, albeit in the form of a smashing arcade game for two.